The billige echt jüdische Bobe is done and ready to be devoured. Up to now we had always used pre-war cookbooks, but this time friends and I turned to “In Memory’s Kitchen: A Legacy From the Women of Terezin” to try out a new meal according to old notes. The recipes in this book were verbally repeated, written down, and collected by elderly women in the Theresienstadt Ghetto. Recounting the recipes and collecting them served as a reminder of food and the home they once had. I don’t want to talk about it much, because it is much more disturbing than that. The elderly in Theresienstadt largely died of disease brought on by horrible malnourishment and starvation rations, if they were not first deported to the death camps. In all likelihood, the majority or all the women who submitted recipes perished in Theresienstadt from complications related to starvation. You can read about the cookbook here. The recipes make me wonder about the women as individuals, and then I feel a kind of connection to them, which makes it hard to face their fate. “Make plain loose yeast dough. When it is risen, place dough on a noodle board. Roll it out. Grate several potatoes onto dough, sprinkle with a lot of sugar and cinnamon, about 2-3 large spoons cold goose fat. Fold and roll dough exactly 3 times. Put (half) in (cake) pan. 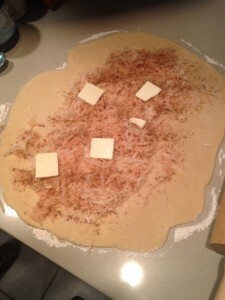 Grated potatoes on dough, sprinkled with a lot of sugar and cinnamon. Our problems began soon after gathering. 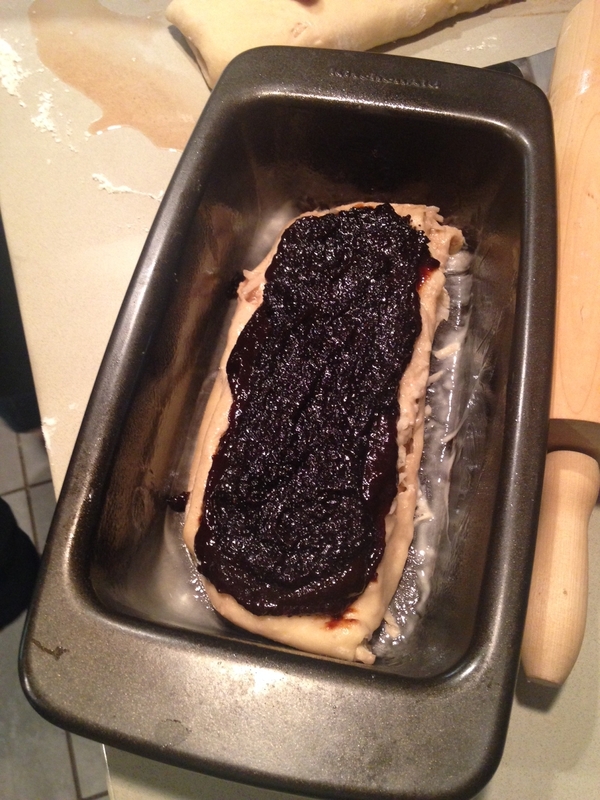 “Make plain loose yeast dough.” Loose. What does that mean? I guess that it isn’t so dry or rigid, or maybe it has extra egg or fat? We immediately had to consult an English-language German baking book to see how one makes yeast dough. We never really learned what “loose” might mean. At any rate, I recommend you find a basic recipe for yeast dough and go with that. Let me mention, my friend is from Germany and she has a scale for weighing the ingredients. 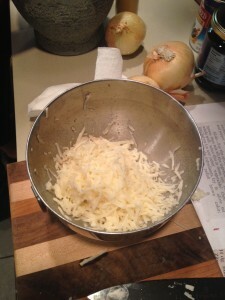 We therefore didn’t have to figure out the amount of ingredients using the English weight system or portions (i.e. cups, teaspoons, etc.). Poppy seed spread hides the prune butter on top of the dough. Once we had our yeast dough, the rest moved along simply, because the recipe is so basic. If you do have questions, the pictures we include should help illustrate some of the points. Not being the kind of household that just has goose fat lying around as they did in the Europe of 120 years ago, we used ample butter. You can see about how much we used in the photographs. We used two potatoes. These were estimations, but they worked well for us–you are welcome to use more or less butter and potato, of course. The prune butter and poppy seed spreads were simple. We spread both liberally, one spread on top of the other. We used both of these pastes out of cans bought at the local grocery. A piece of poppy seed pleasure. As with all the recipes in the Theresienstadt cookbook there are no temperature settings or time periods regarding the actual heating of an item. 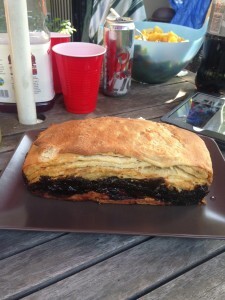 I relied on my friend’s experience as a baker on this one. We kept it at a lower heat of 375 degrees Fahrenheit for 45 minutes. When it was done we brought it out to the backyard, where we were having a whole meal. It looked and smelled really good! Much of the prune butter and poppy seed had oozed enticingly out of the sides. We cut the cake into slices and found it very good. The inside was quite moist, so the result was chewier than expected, but the texture I actually found really pleasant. 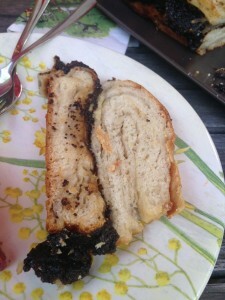 And for me, you can’t go wrong with prune butter and poppy seeds!